An investment review at Qatar’s wealth fund could lead to a cut in money allocated to the mining sector, potentially hitting ventures such as QKR Corp, according to five sources familiar with the matter, says Reuters. Such a move would be the latest in a string of rethinks by sovereign funds and investment firms that have been badly burnt by bets in the natural resources sector, largely due to the recent pullback in oil, gas and metal prices. Late last year, Qatar named ruling family member Sheikh Abdullah bin Mohamed bin Saud Al Thani as the new head of the Qatar Investment Authority (QIA), one of the top investors globally. Under the new management, the QIA has started to review its strategy, and the mining sector – under pressure from weaker metals prices and shrinking margins - is now seen as less attractive, said the sources, who declined to be identified because they are not authorised to discuss the matter publicly. “Various changes happened at the fund in that part of the world and have created a situation where it seems there is no further support for mining,” a London-based banking source said. One of the businesses that could be hit by the results of the review is QKR, a private company founded by veteran mining banker Lloyd Pengilly. QKR’s largest backers are the QIA’s Qatar Holding and Kulczyk Investments, an international investment company founded by Poland’s richest man, Jan Kulczyk. Each put in almost half of the money managed by QKR, according to sources. “(The Qataris) don’t want to put money to work through this strategy anymore,” said a Canada-based mining company executive. “They are cutting back,” he said, adding his understanding was that the Qataris wanted to reduce their investment in QKR. Qatar Holding is also the largest shareholder in giant mining and commodity trading house Glencore, but two sources said it was unlikely Qatar would review that stake. An expected acquisition spree in the mining sector by private equity and private mining groups has not transpired, despite reports that tens of billions of dollars stand ready to be deployed. Industry players blame this on a lack of attractive targets, intense competition when assets come on sale and the long timelines for developing mines compared with most investors’ horizons. 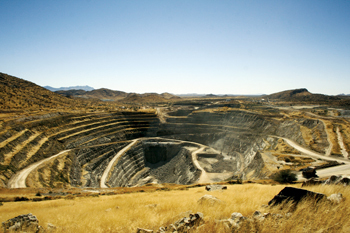 QKR bought its first asset, the Navachab Gold Mine in Namibia, from AngloGold Ashanti in June 2014. It was considering buying Canadian copper miner Nevsun Resource, but failed to get the necessary backing as the Qataris were not comfortable with the investment in Eritrea where Nevsun’s main asset is located, according to two of the sources. “On QKR, it sounds like the Qataris just want to keep that particular asset (Navachab) and run it as a separate entity,” said the London-based banker. QKR could look for new backers should the Qataris rein in their investments in mining, according to a second mining industry source.